It has always been our aim to make freely available to scholars as much of our archived information of this nature as possible. We appreciate that, in their original form, these catalogues are in the public domain; however, the research, difficult and costly acquisition, archiving and photographic work undertaken by our volunteers over nearly twenty years was being taken and used, even sold, elsewhere with neither permission nor recognition. We regret that, as a result of this plagiarism,we found it necessary to temporarily remove these files, but have now restored them, with yet more throughout the site for your own research. Please respect our copyright. Click on the image of each catalogue cover to view as a flip-page document. These files are in considerable detail, which zooming-in will reveal if required. 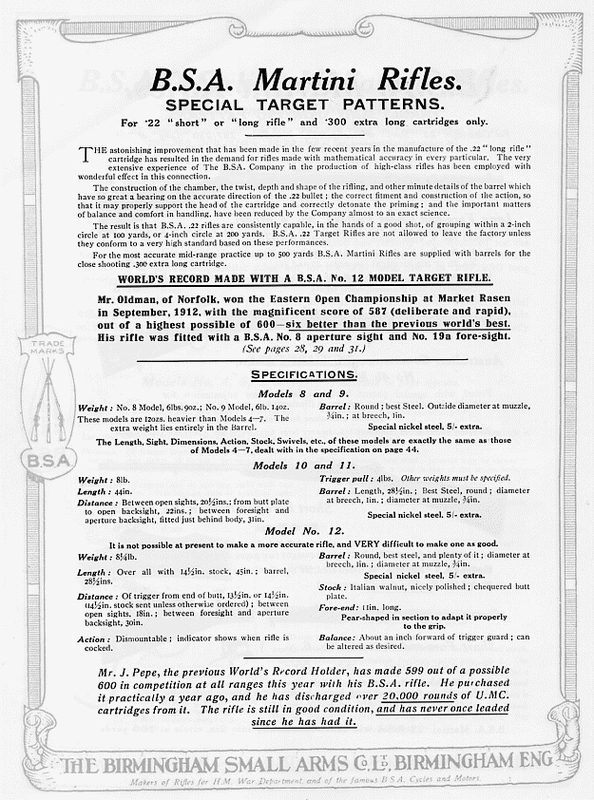 In 1912 BSA also published a brochure on the cleaning of their rifles. "For all kinds of rifles" was the description of content. The all-products Rifles and Rifle Sights catalogue, contemporary with the previously listed Sights only catalogue, is shown below. The following catalogue was probably published only a year or two after the one above. It is identical except for a very few differences, the most obvious of which is that the useful, but no doubt more costly to produce, section tabs of the previous edition have been dispensed with. Internally, this later edition has a few additional inclusions and omissions.
" The stock of B.S.A.-Parker Sights has been handed over to Messrs. A.G. Parker & Co. Lt., Bisley Works, Whittall Street, Birmingham. Enquireies regarding thes sights should be addressed to them"
After B.S.A. 's stocks of these sights had been tranferred to Parkers, BSA then only advertised their own design under the No.9 numbering models A through G over the following years. The removal of this information on page 28 allowed its replacement with fitting instructions for the No.8 folding rear aperture sight in its various heights. The sights themselves remained on the opposing page 29. There was an increase in the cost of the B.S.A. "Adder" air-rifle pellets, which was shown using another glued-in amendment sticker. Page 31, of the B.S.A. Foresights for Target and Sporting Rifles, had a paragraph added advising that the No.19 combination fore-sight was now "fitted with an outside lever ( not illustrated ) by means of which the sight angle may be readily turned over when the second alternative is required. In this new design the angle is held firmly in either of its two correct positions. The price of the improved sight is as before". This refers to the flip-over option of a blade or an aperture fore-sight element, which had previously required a fine screwdriver to make the change from one to the other. It is not particularly encouraging to be reminded how little most prices then altered over periods of several years, compared with today's frightening rates of inflation. The next amendment was to page 32 for the Wind-Gauge Sight Slides, from which the two No.3 pattern slides were removed, as well as the No.2 and No. 5 elevation leaves. The space released was used to advertise the books "Notes on rifle Cleaning", and "The Complete Air Gunner". Not that the latter term was then used in the nowadays more commonly understood way, before the second understanding of it was to become well-known with the advent of the brave air-gunners of the First and Second World Wars. Mr. Oldman, of Norfolk, won the Eastern Open Championship at Market Rasen in September, 1912, with the magnificent score of 587 (deliberate and rapid), out of a highest possible of 600 - six better than the previous world's best. His rifle was fitted with a B.S.A. No.8 aperture sight and No.19a fore-sight." The previously blank page 48 at the end of the catalogue became that for the B.S.A. No.2 Folding (Pocket) .22 Rifle, retaining the same 48 page format to the document. It is pointless to include all the identical pages in the PDF, so we have only shown the four main amendments. 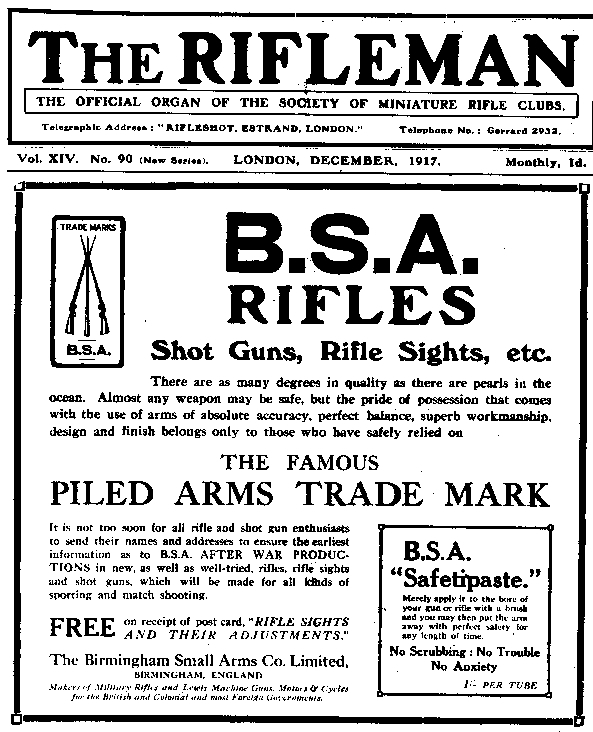 In December of 1917, BSA advertised on the whole front cover of "The Rifleman". This was the journal of the Society of Miniature Rifle Clubs, encouraging readers to enquire of post-war products. Already it was obviously hoped, perhaps rather optimistically, that the War could not last much longer and that it was necessary to consider ongoing civilian commercial needs. In the event, nearly another year was to pass before the Great War ended , with terrible further loss of life, officially at 11:00 a.m.on the 11th. of November 1918. In July 1919 BSA published their first post First World War Catalogue - noted as being "Preliminary", but compared with the later 1919 edition - available as a reproduction, only the artwork framing each page is different. The content of the catalogue is identical. It included Service rifles, full-bore sporting rifles, small-bore rifles, air rifles, shotguns and accessories. 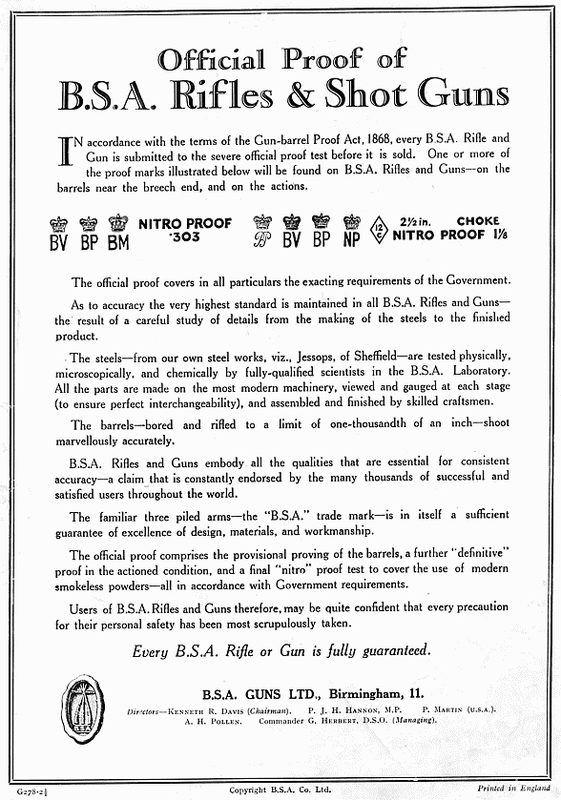 This was a remarkable achievement at a time when it was critical, for the survival of the Company and the jobs of as many of its staff as practicable, that the now cancelled war-time military small-arms contracts were replaced by as much civilian production for general consumption as the Company could muster. We also illustrate a catalogue for W.W. Greener. This catalogue is, at its earliest dating, Autumn 1914, and is unlikely to be much later than 1915, when the company's efforts and production would have been put over to wartime requirements. Had the catalogue been printed post the First World War it would probably have been much less comprehensive. There is nothing at fault with the scans, it is simply that the apparent ghosting is caused by the wafer-thin paper on which the catalogue was printed allowing the print on the reverse of each page to show through..